Top Class Education Scheme for SC, ST.Scholarships for Top Class Education for students with disabilities, Scholarship for Students with Disabilities, Scholarships to AP, TS SC, ST, BC, Minority, disabled students for 2018-19, Central Sector Scholarship Scheme of Top Class Education for SC Students 2018. The Finance Minister in his budget speech on the Union Budget 2005-06 made the following announcements: “The key to empowering the scheduled castes and scheduled tribes is to provide top class education opportunities to meritorious students. The three on-going scholarship schemes for SC/ST students under the Central Plan – pre-Matric, post-Matric and merit-based – will continue. To provide an added incentive, I propose a new window: a short list of institutes of excellence will be notified, and any SC/ST student who secures admission in one of those institutes will be awarded a larger scholarship that will meet the requirements for tuition fees, living expenses, books and a computer. Objectives and Coverage: The Scheme aims at recognizing and promoting quality education amongst students belonging to SCs, by providing full financial support. The scheme will cover SC students for pursuing studies beyond 12th class. The scheme will operate in all institutions notified by the Ministry of Social Justice and Empowerment. (iv) a latest computer with accessories like UPS, Printer, Multi-media limited to Rs.45000 per student as one time assistance during the course. The Institute will procure computers and supply to the awardees. Alternatively, the Institute may also consider re-imbursement of expenses made by a student on purchase of the computer, limited to Rs.45,000/- provided, the computer and accessories are procured from a reputed manufacturer/supplier. The scholarship, once awarded, will continue till the completion of the course, subject to satisfactory performance. 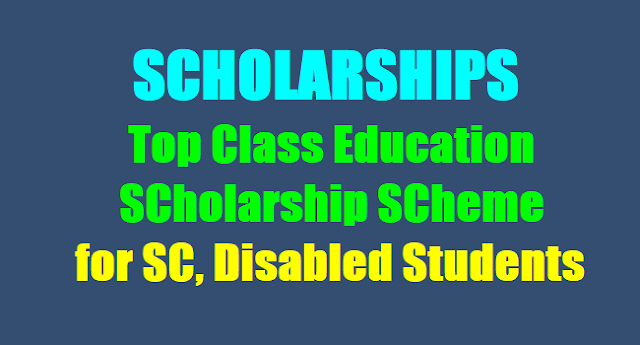 Those SC students who have secured admission in the notified institutions according to the norms prescribed by the respective institutions will be eligible for the scholarship under the scheme to the extent of the number of scholarships allocated to the institutes concerned. In case the number of students admitted exceeds the number of awards, then the scholarship will be restricted to the top ones in the inter-se merit list. The remaining students from SC category admitted in the institute in different courses shall be eligible for the Post-Matric Scholarship (PMS) administered by this Ministry as a Centrally sponsored scheme, provided such students are otherwise eligible for the said scheme. In case, the institute finds that the number of eligible candidates in the 1st year are less than the number of scholarships allotted to it, the balance scholarships may be offered to students studying in 2nd, 3rd and 4th year, etc. on the basis of inter-se merit of previous year's result giving priority to those with higher number of years left to complete their respective course i.e. 1st year student is to get priority over the 2nd year student and so on. The total family income of the student from all sources should not exceed Rs.2.00 lakh per annum. The scholarship will be terminated if the student fails to pass the final examination of each year or any terminal examination prescribed. He will, however, remain eligible for the Post-Matric Scholarship. The List of Reputed Premier Institutions to be covered under the scheme along with number of scholarship slots is at Annexure-I. Any addition or deletion to the list shall be notified by the Ministry of Social Justice and Empowerment, Government of India, as and when required, based on the recommendations of the Steering Committee. The overall number of fresh scholarships per year would be capped at 1250. The Scheme will be funded by the Ministry of Social Justice and Empowerment on 100% basis and the funds shall be released directly to the institution concerned. The funds may be released by the Ministry of Social Justice & Empowerment in a single installment immediately after the admission. The scholarship will become payable to SC students only upon securing admission in any of the institutions notified by the Ministry of Social Justice & Empowerment. The students, who are awarded the scholarship under the scheme, shall have to pursue the study in the respective institution on whole time basis. With a view to ensure access of all students to the provisions of this scheme, the institute will incorporate the salient features of the scheme in the prospectus in addition to putting the same on the website of the institute. The institute will select the SC students on the basis of merit and shall forward the applications of the eligible students in the prescribed proforma (Annexure-A for fresh students & Annexure-B for ongoing students) along with proof of admission and fee chargeable etc. to claim the scholarship. The Institute will not charge any fee, whatsoever, from the students. 6.4 After disbursement the institute will furnish an Utilization Certificate towards the amount received, which will include the signatures of the scholarship holders. The performance of the SC students covered under the scheme shall be monitored regularly by the Head of the respective institution and the same shall be reported, through a report card, to the Union Ministry of Social Justice and Empowerment at the end of each academic year. The notified institutions shall submit progress reports of implementation of the Scheme to the Union Ministry of Social Justice and Empowerment from time to time, as required. Any institution violating the provisions of the Scheme and/or instructions issued by the Government of India will be denotified. In the event of denotification/deletion of any institution, the scholarship will continue to be available to the SC students already admitted under the Scheme, if otherwise eligible, till completion of the course. However, no fresh seats will be allotted and funds released to such denotified institutes. The general provisions of the General Financial Rules (GFR), 2005, will apply mutatis mutandis, and the institutions shall be bound by the general principles laid therein. The Committee may invite an expert as a special invitee, as and when it deems necessary. The Committee may recommend to the Ministry of Social Justice and Empowerment about addition or deletion of any institution based on their performance. For the purpose, the Committee may take into account the recommendations of the concerned bodies conducting entrance examination for admissions into such courses or having the administrative control over such institutes. The Committee may periodically review the performance of the selected institutes on the basis of the academic results.